The “A” score goes to three-time winner CD’s Wings in Westminster for two perfect inspections in a row. 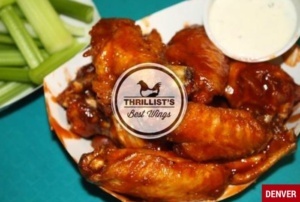 Thanks for featuring on your Best Wings list, Best Things Colorado! We’ve been nominated for the Best Wings in Denver in the Cheap Eats category for 2017! Click the link below to vote for us! Our second appearance on Restaurant Report Card, with the “A” of the week! 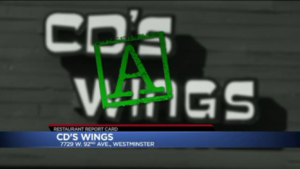 The “A” goes to CD’s Wings in Westminster for back-to-back inspections with no violations. 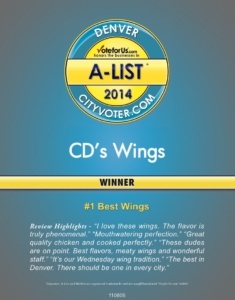 This is the second time CD’s Wings have made our report card with perfect health inspections. The first time was February 2015. Winner of the Best Wings in Denver! Our first appearance on Restaurant Report Card, with the “A” of the week!